Turrialba Volcano increased its activity once more over the weekend with vapor, gas and ash explosions, volcanologists from the University of Costa Rica (UCR) and the National University (UNA) reported. Activity at the volcano, located in the province of Cartago, some 70 kilometers (43 miles) northeast of San Jose, remained low during the past three weeks, with mostly low-intensity tremors, the UCR's National Seismological Network (RSN) reported. RSN volcanologist Mauricio Mora indicated in a written report that ash and vapor spewings of almost 500 meters (1,640 feet) above the crater resumed along with an increase in volcanic tremors. UNA's Volcanological and Seismological Observatory of Costa Rica (OVSICORI) reported a strong explosion at 10:30 a.m. Saturday. On Sunday, the RSN reported another explosion at 8:46 a.m.
Turrialba entered an active phase in October 2014 and has since presented numerous explosions of ash and gas. OVSICORI experts noted that they found rocks up to 2 meters (6.5 ft) in diameter in the surroundings of the crater. In September 2016, the volcano began a new eruptive cycle that has generated ash columns of up to 4,000 meters (13,000 ft) above the crater. 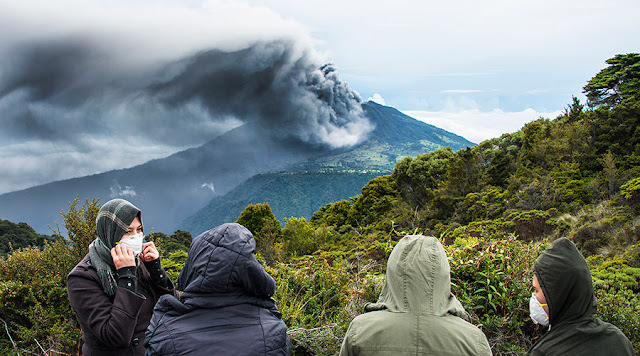 Access to Turrialba Volcano National Park is currently closed and emergency agencies maintain a security perimeter of two kilometers around the crater. However, park rangers have reported that groups of tourists have been entering the restricted area to observe the explosions. Strong gusts of winds are carrying ash into the area northwest of the crater. Ash reached various communities in the Central Valley, mainly north and east of San Jose. Posts on the RSN and OVSICORI social media profiles reported ash fall and the smell of sulfur in several communities. Most of those reports are from residents of Coronado, Ipis, Guadalupe, Tibas, Moravia and Sabanilla. The National Meteorological Institute (IMN) on Monday reported the influence over Costa Rica of a cold front that entered the country on Sunday from the northern Caribbean Sea. The weather phenomenon is increasing the intensity of winds in the Central Valley and in the province of Guanacaste. The IMN reported that gusts in the first half of this week will oscillate between 60-80 kilometers (37-50 miles).